Located just a short drive south of Reedsport and just east of Oregon Dune National Recreation Area, William Tugman State Park has plenty of resources to offer for the day use visitor or the overnight guest. 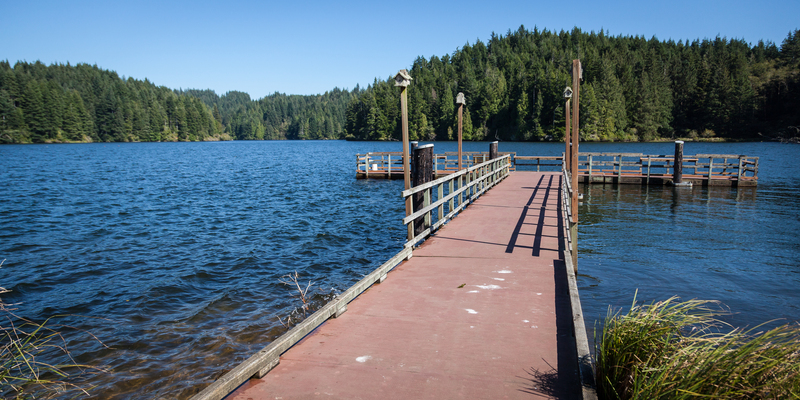 The adjoining campground is a significant draw to the park, but it’s also worth noting that the park has the only public boat ramp on Eel Lake. This lake is ideal for swimming, fishing, and paddling; a lake-wide speed limit of 10 miles per hour helps to ensure a tranquil experience. Note that conditions on all coastal lakes are subject to quick changes, so keep an eye on winds and visibility in marginal weather. The day use facilities also include plumbed restrooms, several picnic areas, a playground, and plenty of open, grassy space. The gazebo is available for group functions on a first-come, first-served basis. Tugman is a great choice for families in the area looking for a little variation from sand and surf. A day at the lake can be a welcome change, and frequently the fog that sits on the beach may leave the inland lakes alone.